Most frequent effects include rollover, skiing, jumping over obstacles and other jumps, head-on crash stunt, side collision, sliding, hit by a car, bootleg turn and other high-speed stunts. Rollover is one of more complex vehicular stunts. It is not so much of a problem to roll the car over but rather to keep the stuntman safe and sound. Regardless of the rollover method, protection methods are similar. The safest way to protect the car roof from collapsing under the vehicle’s weight is to use a roll cage or a steel frame around the car. To make your car ski, you usually use a ramp, but instead of a sudden turn of the steering wheel, the vehicle is balanced on two wheels. This stunt is not complicated, but it requires practice for each vehicle. It also requires some body work reinforcements that would increase the resilience of the vehicle and allow for the stunt to be repeated several times. The protection is the same as with the rollover stunt, as the vehicle might roll onto the roof at any time. Jumping over obstacles and other jumps is a stunt that requires calculation and extensive preparing. Most vehicles have their engines placed in the front, so the centre of the mass is also at the front. In real life, during the jump, the vehicle would simply smash with its front part into the ground and roll over under its massive weight. When performing these stunts, we use vehicles with engines in the back, or apply weights that enable us to balance the vehicle in the air. For this stunt, we also need to reinforce the vehicle, in case we intend to use it to repeat a stunt. The protection used varies depending on the danger of the jump, ranging from 1 metre to 10 metres and more. The most dangerous scenes require a roll bar, vehicle reinforcement, balance weights, airbags, helmet and more. Head-on crash is a stunt often used in movies, performed at a speed of up to 50 km per hour. At higher speeds, the vehicle may suffer greater or even total damage. As the danger is much bigger, these stunts are often performed without a driver. The camera and pyrotechnics can make the crash done at a speed of up to 50 km per hour look much more dangerous than can a crash of a vehicle moving at 200 km per hour. Plus, the damage to the vehicle can be minimal, which is the most important for our production. This also lets us use vehicles dozens of times throughout the day to shoot the same move. Director’s tricks and stunt make it possible to use expensive cars when shooting the crash – making the stunt look real, but without actually damaging the vehicle. Side collision is the second most popular stunt to shoot, but also the most dangerous when it requires colliding into the driver’s door. Depending on the need, it can be done with minimum or no damage. When performed at greater speeds, it may require standard bumpers, but also internal reinforcement to the vehicle with steel bars and additional protection of the stuntman driving the car which is being hit. 1. vehicles move at a full speed, side by side, and push each other, to throw the other vehicle off the road. 2. a vehicle moves in one direction, while the other vehicle enters the intersection at a full speed, moving to hit the first vehicle sideways. Instead of colliding, the vehicle makes a turn and hits the vehicle by sliding beside it, and then both continue in the same direction. Sliding includes a mild car impact and doesn’t necessarily damage the vehicle, unless it is required. Hit by a car is a frequently shot stunt. The very fall over a car is a pedestrian stunt, but since the vehicle that hits the stuntman-pedestrian needs to move in a certain manner, this move is seen as a vehicular stunt. The vehicle moves at a speed of up to 60 km per hour, and its movement helps the stuntman-pedestrian to not get hurt. A bootleg turn means turning the vehicle by 180 degrees and more, in respect of its direction. The manoeuvre is done by using a hand brake, which is adjusted for this purpose so that it can better steer and block the wheels. For the turn to be greater and more effective, fine gravel, sand or oil can be spilt over the road. 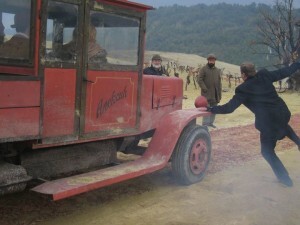 The move is done by suddenly turning and pulling the handbrake at the exact spot, previously set for the stunt. A similar effect can be produced by suddenly increasing the number of revolutions at the moment of turning, making the wheels spin. In terms of protection, the immediate vicinity is crucial so that the vehicle wouldn’t hit the parked vehicles or other vehicles moving. Other vehicular stunts include avoiding collision, passing through the congested intersection, driving in the opposite direction. All these scenes require good timing, and following the set benchmark (time and position). The stuntman-driver, steering the vehicle through the congested intersection, needs to pay attention to the minutest details about the place and actions of all other people in the stunt. All other stuntmen drivers have their benchmarks (places) where they will stop or speed up. Only through good timing is it possible to make the stunt look real and perform the move safely. When driving the vehicle in the opposite direction, we must determine the moment and the lane of the next vehicle; otherwise the collision is bound to happen. Timing comes through practice and repeating. Stunts with fire most often include burn scenes, walking through fire, escaping house/vehicle on fire. 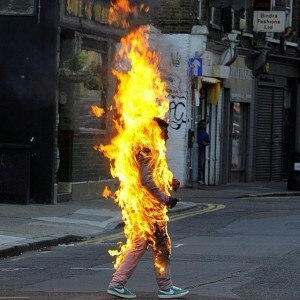 Human torch is a move in which the stuntman runs while set on fire, with flames and smoke rising 3-4 metres above him. The stuntman is wearing nmx and cbx suit beneath the scene costume. This move requires the stuntman to be highly concentrated. 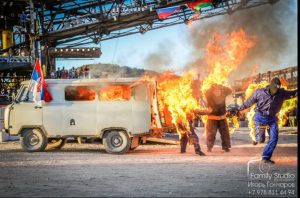 The stuntman lowers his head towards the chest (not on fire) and waves his arms (set on fire on the outer side), turning in circle, which makes the stuntman look as if he is entirely set on fire. 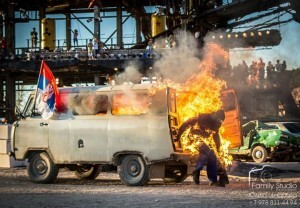 The stuntman then drops to the ground, his abdomen facing floor, while the stunt assistant uses a wet blanket or CO2 fire extinguisher to extinguish the fire on his colleague’s back. Fire is extinguished using a wet blanket or CO2 fire extinguisher, strictly from the head towards the legs, so that the flames would be directed towards body parts that are in lesser danger (legs). Passing through fire contains all protection elements as the human torch, but in many cases, it also requires wearing a protective mask over face and hair. Exiting a house or car set on fire is a common stunt, which requires all protection elements used for the human torch move, but also requires wearing a protective mask, gloves, and often even a small oxygen tank. This stunt means we need to be careful if we work with wooden objects, as a part of the construction on fire can fall on us once the beams are burnt. Falls are the most frequent moves used in stunts. We often perform: falls in battle, bullet falls, falls out of a moving vehicle, falls over a vehicle, falls off motorcycles and bicycles, falls off a horse, high falls, rolling down a cliff, falling off a moving train. We use several methods to ease consequences of the fall. To perform a fall and avoid an injury, we often use wrestling, judo and aikido methods. The principle behind these moves is the protection of vital organs and the skeleton from an injury when hitting the surface by using amortisation, good body posture during the fall, easing the fall itself by rotating or compensating the impact with arms or legs. Amortisation means using arms and legs like a shock absorber to help ease the fall. It is the simplest manner of protection during the fall, but not the most efficient one. A good body posture during the fall means turning the body during the very impact with the surface in order to protect the spine, skeleton and vital organs. It is forbidden to fall directly on the surface with your back (spine), ribs, head, knees and elbows. The principle behind the methods is to take the greatest possible energy away from the fall just before our whole body hits the surface, by using a swift blow of our arm or leg (most often combined) onto the surface. At a greater speed relative to the surface, and greater speeds in general, we first use amortisation, then rotation and finally compensation. When shooting a fight scene between two or more stuntmen, we often use tripping, throwing, pushing and other moves to make the fight look more effective and real. In doing so, we perform various falls to protect ourselves from injuries. The most frequently used methods are good body posture and compensation, and, in some cases, rotation. The stuntman changes the way he does these falls, depending on the place where the bullet “hit” him. As a rule, unlike the actor, the stuntman “dies” faster, often turning his back to the camera so that his face wouldn’t be seen. The aim of the stuntman is to perform as many moves as possible during a film – but if he is caught on camera, he won’t be able to act in other scenes. That is why the stuntman is “invisible” to viewers at home. Depending on the place where the bullet hit him (which the stuntman already knows as he has fulminate attached on that spot) and the size of the gun, the stuntman performs the falls differently. At largest calibres, the effect of the blow (jump) is the highest – the stuntman even falls, turning upside down. The compensation of the blow is the same as with other low falls: safe body posture, rotation and compensation of the impact. The falls are done using different types of vehicles moving at a speed up to 50 km/h, and they are done almost identically. The most frequent protection method is rotation, as it takes away the largest amount of energy from the fall. Depending on the height from which the fall is done, the first contact with the ground is eased by amortisation – for greater heights, or by using compensation – for smaller heights. The very speed of the movement pushes us into rotation, and the correct body posture protects us from further injuries. As this manner of fall is one of the most dangerous in this group, it requires personal protection of the stuntman. When falling out of a car, it is necessary to tilt a car while driving to ensure the necessary space between the vehicle and the stuntman. Depending on the requirements of the film, falling on a bonnet can be performed directly or with bouncing. Falling directly on the bonnet is a more dangerous method, and is done by more experienced stuntmen. It is performed in line of the vehicle’s direction or in the opposite direction. The protection method used is strictly amortisation using arms, and then rotation. It requires superb coordination of movements since the stuntman might hit his head in the bonnet, if late. The fall with bouncing is done over the bonnet and diagonally in order to avoid hitting the bonnet. The stuntman then bounces off the car for 5 meters until he drops to the ground. The protection method is also amortisation with arms and then rotation. The stuntman driver helps the stuntman pedestrian do the fall, by easing his initial contact with the vehicle, and then bouncing him so that he falls as far away from the vehicle as possible. When bouncing off the vehicle, the stuntman falls in the same manner as with the falling out of a vehicle. These falls are done the same as falls out of other vehicles; expect one should pay attention to the motorbike movements after the stuntman’s fall, so that it wouldn’t squeeze him. In some cases, special falls over motorbikes can be done – at a full speed (usually 60 km/h), the vehicle hits directly into an obstacle (most often, this is another vehicle). The motorbike then does a somersault, and the stuntman who is driving the vehicle needs to jump away from the bike so that it doesn’t squeeze him. One of the ways to do this is to raise legs onto the grip and use them to do amortisation of the blow, and then jump away from the motorcycle, sometimes flying up to 20 metres before doing a fall. Here we will look only at falls off a horse without having the horse stumble. These falls can be done while the horse is standing, rearing up, trotting or galloping. They are performed like other falls done at a speed (vehicles), but the initial contact with the surface is eased through amortisation or rotation while in air. These falls are usually done with fulminate as the stuntman falls because he was hit by a bullet or due to explosion. The stuntman jumps onto the surface, amortises the blow and moves into rotation. Protective equipment includes personal protective equipment of the stuntman. When falling off a horse that is rearing up, the stuntman jumps off the horse and falls doing a somersault in the air (backwards), making amortisation with his legs or arms when falling onto the surface. He then eases the fall through rotation and compensation. High falls are among the most attractive stunts. When performing these, we use a lot of additional equipment. Card boxes make the first protection system are. The second protection system is an airbag and the third one is a titanium cable. Safety boxes are used for falls from heights up to 50 meters. An airbag is quite an active system of protection. It allows performing falls from heights up to 100 meters. The third system – a titanium cable – is a more modern system of protection and it allows doing falls from over 100 metres. This is not a free fall but rather rolling down a cliff. It is done at locations of different configuration, with slope measuring up to 75 degrees. Unlike the standard methods of rotation, which are done like a roll forward or backward, this is a side rotation. It allows the stuntman to stay close to the surface, which makes the stunt much safer to perform. Near the end of the hill, where the slope of the surface is much smaller, it is possible to change into a regular rotation (roll). The equipment used is the personal protective equipment of the stuntman, and sometimes boxes or an airbag. These stunts are often used during film shooting. 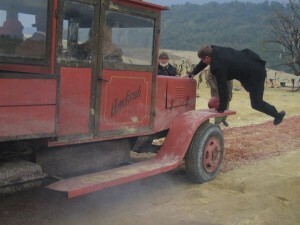 Action usually takes place on a railway wagon, after which the stuntman “dies” by falling off the wagon. Cardboard boxes or an airbag are used for protection. However, depending on the speed of the train, it is necessary to set up more boxes so that the stuntman wouldn’t miss them. It is preferable to put the protective surface under a small angle. Unlike falls, jumps are done with intention and look much more skilful than falls. The most frequent stunt jumps include: roof to roof jumps, jumps into water from great heights, jumps with skies (ski jumping), rollers or skates, jumps through glass surface, jumps from explosion, jumps from a moving train, jumps over a moving car, jumps from a cannon, jumps on a springboard, catapult, free jumps and jumps over hurdles. These jumps are done on roofs of similar heights. The distance between buildings must not be over 3.5 metres – if they are of the same height, and it mustn’t be over 5.5 metres – if the building onto which the stuntman jumps is lower (at least 3 metres lower). Besides personal protection, this move requires preventive protection beneath the building in case the stuntman doesn’t make it across – protective layer (boxes or an airbag). If the building onto which the stuntman jumps is over 2 metres lower than the one from which he jumps, it is necessary to set up a protective layer on the building itself as well (place where the stuntman will fall). To ease the stunt, we first use amortisation and then rotation. If the stunt is done with a protective layer, we first use correct body posture and then rotation. These jumps are done from a height of maximum 50 metres. They are usually feet-first, while head-first jumps are done from height of up to 35 metres. If an acrobatic feat needs to be done, such as a somersault or other air rotations, the height is reduced to 20 metres. Take-off is important for feet-first jumps, as the stuntman, in case he takes off incorrectly, will have a lot of difficulty trying to return his body to the desired position. The balance in the air is achieved by flexing the body relative to legs, waving head and arms. The stuntman uses a neoprene suit, sometimes thick up to 10 millimetres. This suit reduces the effect of the blow when the body hits water, as otherwise hematoma can appear, or skin can even break. Orientation in the air can serve as a preparation for these jumps. Orientation in the air is best practised on large trampoline and air bags. When shooting scenes that require stunt explosion, stuntmen do jumps and, pushed by the force of the explosion, they can fly over 10 metres. To protect the camera and other objects in the vicinity, we often use explosives with smaller blasts – and the stuntman jumps away due to the explosion itself. We can also use a device that pulls away one or more stuntmen at once, or a small piston catapult. The stuntman must protect his eyes and face from the explosion, and ideally, he is turned with his back towards it. If a high jump stunt is done on this occasion, then a protective layer is also set up. It is preferable that the stuntman use earplugs due to detonation. To ease the effects of the stunt, we use rotation and compensation. This jump is similar to the fall out off a moving vehicle, but it requires more skill to be performed. It is done at a speed of up to 50 km/h. The terrain where the jump is to be performed needs to be cleaned from rocks and other objects. There are several ways to do this jump, depending on the needs of the film. Most often, it is done by a stuntman who jumps, as if trying to run, but then falls and rotates. Good body posture is immensely important, as it guarantees safety. To ease the effects of the fall, we use our legs for amortisation, then rotation and finally compensation. There are many ways to do this jump, but the three most frequent ones are: jumping over a car at a full speed directly without touching the car, jumping over a car at a full speed laterally without touching the car and jumping over a car by bouncing off it. In the first two cases, we use low cars. Depending on the construction of the cannon, the stuntman can fly over 20 metres. Good body posture in the cannon is crucial, and the stuntman uses personal protective equipment. The stuntman can also use acrobatic feats during the jump, which he practices on a trampoline or airbag. The principle behind this stunt is simple and allows the stuntman to do a jump up to several metres high. The stuntman is standing on one end of the plank, while the other side is lift from the surface. There is a solid fulcrum at the middle of the plank. Another stuntman or a load drops onto the empty end of the plank and, by using the lever effect, lifts the other stuntman, who then jumps away several metres.